Defender Luke Woolfenden was “buzzing” after making his Championship bow from the start of Saturday’s 4-0 victory at Reading. The 19-year-old was recalled from his loan spell with Vanarama National League on Friday and with Cameron Carter-Vickers and fellow youngster Chris Smith having picked up knocks went straight into the team at the Madejski Stadium. “Buzzing, 4-0, the last three came late on, one after the other, didn’t they?" Woolfenden, whose previous senior appearances for the Blues were one start and one sub appearance in the Carabao Cup in August, told BBC Radio Suffolk reflecting on a remarkable first league game for Town immediately afterwards. Woolfenden had praise for Adam Webster, stand-in skipper Jonas Knudsen and Jordan Spence: “Webby, Jonas and Spence were brilliant, they helped me through the game massively. The Ipswich-born defender played on the right of Town’s back three and says centre-half is his best role. He says he found out he was coming back to Town the day before the match having been with the Ravens since just before Christmas: “There was talk of it about a month ago but the thinking was to just stay at Bromley until the end of the season. His return to the Blues means he’ll miss out on next month’s FA Trophy final when Bromley face Brackley at Wembley. “I didn’t want to come back just to sit on the bench,” he continued. “I think that’s why they left it so late because they knew I’d played the last two games [at Bromley]. “[The loan spell has] progressed me massively, they’ve all helped me a great deal, [manager] Neil Smith, [academy director] Mark Hammond and [player-coach] Alan Dunne have helped me a lot. Having started the Carabao Cup tie at Crystal Palace after making his senior debut as a sub at Luton in the previous round, he admits he felt he might have been involved with the Blues first team before this point in the season. Elsewhere, Boro boss Tony Pulis has said he’ll consider resting some of his squad next week with the fifth-placed Teessiders having already confirmed a place in the top six. “We’re delighted that we’re now in the play-offs,” Pulis said. “Now, it’s a case of looking forward to the Ipswich game, and then going on from there. “One or two players might need a rest, and one or two players might be taken out of the Ipswich game. Alternatively, I might go with the same team. “I’ll have a good look at it next week and have a good chat with the boys, and see where they are. Then we’ll look forward to those play-off games. “The most important thing is that we’re right when we turn up here for the play-offs. The Ipswich game is important because it’s the next game, and anyone who knows me as a man or a manager will know that every game I go in to, I want to win. Meanwhile, Blues midfielder Andre Dozzell is continuing his comeback from the ruptured cruciate knee ligament he suffered on the opening day of the season, using the facilities at Pipers Vale Gymnastics Club. "Big thanks to Woolfenden for playing a not inconsiderable part in us getting to Wembley", "He has been an excellent part of the team and deserved to be involved at Wembley. Good luck for the future Luke, you’ll go far in the game I’m sure", "Welcome back here anytime." "Luke did a good job for us and is going to be a very good player", "He more than played his part in getting Bromley to the [FA Trophy] final", "Well done to Woolfie for a clean sheet in his first League start for ipswich, I'm sure he will break into the first team next season." Enough said. Had a good game on Saturday. Didn't in the least look out of place at this level. Hopefully we will see a lot more of the Wolf next season. Had a really good game on Saturday and looked rock-solid. New Manager should be putting him down as an automatic first-team member (if I was Manager, I would). Good on Klug for bringing him back, he could see we needed reinforcement and made the decision. What a name!! Woolfie!!! Love it! Great prospect. I wonder how long it will be before the big teams come sniffing around. I really hope we will have a new policy of keeping our best youngsters and developing a team around them, not selling them off to make some quick cash. Looks very calm and assured,very impressive, and and a big lad. Just regarding the Andre in the vid.did a few of those exercises in the forces never as quick though,he`s like lightening! !, great to see the progress. ITFC have so much talent at the yoof level it`s frightening!! Great potential this lad, gotta love him. Meanwhile, Dozzell looks pretty good in that video. Very encouraging that we have so many youngsters pushing for first team starts. Just provides an injection of enthusiasm and anticipation for an interesting summer after what was becoming a season of angst. Terrific to see Dozzell on the mend, reassuring that he still has another three months to work on his strength and fitness prior to the new season kicking off. the future looks promising COYB. I felt he put in a very good solid performance doing the basic things and not being too clever.Still a lot to learn but a great future prospect.We have some exceptional young lads coming through the ranks now and the future is beginning to look bright. IMPRESSED, suddenly the whole feeling has changed, the gloom, frustration, anger, has gone, things looking bright, just pray we get the right manager. When it comes to these good young players we have and needing a manager who'll give them a chance. I know he's ruled himself out but would be upset if Klug got the job? The wooolllfffff!!!! !...yep will do him the power of good! Dozzell auditioning for Monty Python remake of Ministry of Funny walks. Don't forget to HOWL when Woolfie scores. I know he’s gone now and we move on but ask yourself, would this have happened if Monotonous Mick had been in charge? He’d have probably played Freddy at right back!!!! This is an example, in my mind, of the Ipswich way. All of this has happened by luck rather than judgment, but it shows what talent the next manager has at his disposal. If Chambers or CCV was fit then Woolfy would still have been at Bromley. If Skuse or Hyam were fit then Nydam and Folami would have been on the bench. This has been shown by Klugs team selection, however it produces an interesting dilemma for the new guy as these kids clearly have ability. Absolutely right, Essexnblue, but so pleased to see the youngsters take their chance so well. Huge number of our regular players injured, but that's the Championship for you, the toughest league anywhere. 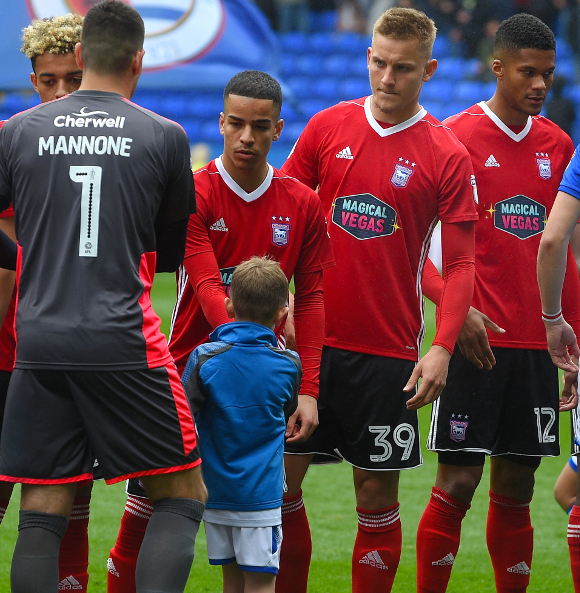 Nice one Luke - definitely one for the FUTURE of ITFC. the youngsters know they have something to prove ,some of the ''old school ,good blokes'' seem to think they don't have to prove anything and were automatic selection. Competition for places is always a good thing. Pleased that not only did Luke get his chance, he showed he was was up to it, and shouldn't be overlooked .GOOD LUCK LUKE . I can remember much discussion on here as to whether we miss Chambers or Skuse on the odd occasion they didn't play under Mick, either because of illness or .injury . Well neither of them played on Saturday ? Turning to Luke Woolfenden,agree that he looks a class act,and could turn out to be a great asset for ITFC in the future;along with several others. I mentioned a while back that there were several lads in the pipeline who had good physique,and Luke fits that category.I felt this season that we are lacking a bit of hight,especially up front.In no way do I want Portman Rd to be 'The Land of the Giants';as Joe used to describe Stoke when he was manager here;but it is nice to have a mixture,which gives the players more options,as don't think we have had a player up front since Murph left who can provide headers and make the ball stick when required. Notice the 'Early Bird' deadline as been extended because of the very high volume of season ticket enquiries/ renewals;but only until Wednesday. Lets not forget that all these youngsters were brought through under Mick's stewardship ! Mick ! who was Mick ?